Paid article presented by Car Shipping Carriers. We spoke with Nicholas Dutko, the owner of Car Shipping Carriers, a vehicle shipping brokerage that has a slightly different mission than your average freight handler: Be transparent, and educate the consumer—starting with us. What did we learn? Simple: Though it may not seem grassroots, paying a professional to move your car is usually cheaper and easier than the alternatives. Let's start by slaughtering a sacred cow: the fly 'n' drive. Yes, this method of retrieving a car is a community tradition; our forum is filled with stories of people jetting off to strange new places, hopping into strange new cars, and driving them home. Is it a fun adventure? Yes, absolutely. We've even done it ourselves more times than we can remember. But in most circumstances, flying out to pick up your car will cost more than having it shipped. You'll have to cover the costs of the plane ticket, gas, food and hotel rooms, and if you add what your time is worth it's almost impossible to come out ahead. "Fair enough," you say. "I've got a truck and trailer. I'll just drive out to the car and tow it home to save money." Nope, odds are that won't work, either. Why? Simple economics. Say we're retrieving a car that's 500 miles away. We hitch our empty trailer to our van and hit the road, paying for food and gas along the way. We arrive at the pickup location, load up our new car, and spring for a night in a hotel before we head back. More road food. More gas. By the time we get home, our van has racked up a thousand miles' worth of wear and tear and averaged 10 mpg. Total cost? Probably around $500, and that doesn't account for money lost by skipping two days of work. If we hire a professional shipper to fetch that car, though, economies of scale come into play. Yes, bigger trucks use more fuel--modern semi-trucks get about 7 mpg--but we won't have to pay for them to drive empty for half the trip. Plus, each truck can carry about 10 cars. Suddenly every cost is a little higher, but spread among 10 different customers. We'll need to pay for the driver's time, sure, but that's time we won't spend off the job, eating on the road, or staying in a hotel. Odds are, a professional shipper will still cost less than towing the car home ourselves or doing a fly 'n' drive. It's the same reason that a bus ticket only costs $1, even though it's professionally driven and a bit of a gas guzzler. There are two basic business models in the car shipping industry: A company either owns a bunch of trucks, or it acts as a broker, coordinating a bunch of people who each own a truck or two. Think UPS versus your local courier dispatch. Is one better than the other? Car Shipping Carriers, a broker, argues that its business model is superior. It gathers auto shipping quotes from many different carriers, a practice it says can lower costs. "The organization was built on the basic principle that competition is healthy as long as customers are receiving transparent information about us," Nicholas explains. What does he mean by transparent information? Basically, Car Shipping Carriers believes its customers should know exactly what each quote they get represents–anything from a dude with a pickup truck and a single-car trailer to somebody with a big rig. This way, customers can decide which vehicle transportation option is best for them. Just like plane tickets, spots on a transport truck rise and fall in price depending on demand. Are you a snowbird shipping your car down to Florida for the winter? That's a popular idea, so expect to pay more than you would during the sweltering summer months when cars are mostly shipping back North. Think of it like your morning commute: If you ship during off-peak hours (or against traffic, like to the Northeast in the middle of winter), you'll save money. UPS doesn't charge the same price to deliver a toothbrush as it does a bowling ball. The same holds true for car shippers. A Camry is more expensive to ship than a Corolla simply because it takes up more space that could be used to haul more cars. Weight matters, too, as every additional pound is extra gas burned and extra truck and trailer maintenance required. Special cars--think exotics, classics or heavily modified vehicles--typically cost more, too. Shippers don't want pay the insurance claim if somebody hits your Maserati, so they'll charge more to cover the extra risk. Here's a rule of thumb for car shipping pricing: If it's a pain, it will cost more. Cars that don't run, don't roll, or are heavily modified take more time and special equipment to ship. Car shipping is affordable because shippers can put a bunch of cars onto the same truck. In a perfect world, they'd all be traveling the same route, too. That's not usually possible, so shipping companies aim for the next-best thing: clustering their pickups and deliveries to minimize the amount of time driving around half-empty and stopping to load and unload. What does this mean for you? If you ship your car along a common route, you'll pay less than the poor soul sending his car from the middle of Kansas to the middle of North Dakota. Finally, the type of transport matters. The three options are open transport, covered transport, and enclosed transport. Open transport is the cheapest, and it's easy to understand why: Your car sits on an open trailer, exposed to the elements for the entire journey. Enclosed transport is the opposite: Your car is sheltered in a hard-sided carrier. Covered transport splits the difference: A fabric that isn't totally watertight covers the trailer, and the cost is less than enclosed transport. Once you have a few vehicle transportation quotes, it's time to take your pick. How do you decide? Simple: Just as if you were buying a new toaster on Amazon, you should read the reviews of each shipper to make sure they meet your expectations. This is also the time to pick a transport option, be it open, covered or enclosed. Your wallet will probably make this choice for you, but it's not a bad idea to think about the weather along the shipping route. An open transporter traveling through Arizona in the dry season will probably stay drier than one headed for Florida's summer showers. Once you pick a shipper and agree on a quote, you'll pay a deposit. This will lock in the quoted rate, and the shipper will have a set period (usually a week or two) to schedule an exact pickup time and delivery window. You paid your deposit, scheduled a pickup time, and cleaned your McDonald's receipts out of your car. Now what? Usually, the driver will call an hour or so before pickup to choose an exact meeting spot. For starters, your shipper probably won't want to pull into your driveway. (Picture a semi-truck trying to do a U-turn in your cul-de-sac.) We're fond of big shopping plaza parking lots, but your driver will have the final say. Once you meet the driver, they'll do a thorough walk-around of the car, filling out a damage report as they go. The goal? To make everybody aware of any damage the car started with. (Hey, who would want to safely deliver a car and then get in trouble for a door ding they didn't cause?) You'll sign the damage report and then get a copy for your own records. After that, your job is over. The driver will load the car onto the truck, hop in the cab and drive away. While you go on with your life, they'll be slogging down the interstate on the way to your car's destination. Once they get there, removal is more or less the reverse of installation. They'll choose an easy place to stop, take the car off the trailer, and let you (or whoever is picking it up) inspect the car for damage against the original inspection sheet. That's it. Now all you have to do is pay the shipper, and the process is complete. Had the 'V' shipped from Portland, Or to Houston metro area......my only complaint was not using an enclosed transporter.....the gray filth was almost borderline grout.....the wipers were minimal at best. It was actually cheaper for me to ship 2 of my cars than to fly and drive. The only one I didn't ship was Atomic Betty as no one was going through that part of the world for a bit so it was going to be very expensive. I have no problems. Shoot, When I whipped the Barracuda to Greg, He got the thing next day moving from Austin to Daytona area. Interesting, I'll eventually need to have my Conquest shell shipped from Cali to central Texas. I'm going to get my jaguar myself because it's in a storage unit and I don't want a hauler to even deal with the logistics of that. But, gas+lodging (60 a night)+food works out to be about the same as shipping. Well maybe a little bit more. Edit: I just did a quote via uShip and I'm getting offers of $800+ thats about 1.5 more expensive than doing it myself! I'd say it depends on how far you are shipping and how much time you can give towards the trip. When I bought my '64 Mini back in early 2013, I considered flying out Los Angles and driving across the country to Philly. Besides the pre-inspection shop not recommending it, it would have been tough to fly one or two people across the country, along with probably a weeks worth of hotel rooms and meals for the $1000 it cost me to have the car shipped. Never mind the likelihood that after 3000 miles in a classic Mini, I'd need another vacation to recover... I still kinda wish I'd done it, tho... it would have been a real adventure. If I ever buy another car from the West Coast, it'll definitely be a fly-and-drive. I also used a broker: https://pricedriteautotransport.com/ No complaints with service or communication. I'm going to look at a car about 100 miles from home tomorrow. I'm going to take my truck and a rental car carrier trailer. I've got to drive there anyway, and it's not that far. Shipping makes sense for most long distances, though. Seeing the pics of the Boxster that got dropped off the back of the trailer with no ramps, plus my personal experience with carriers that damaged the car I had them haul, I would say that shipping a car is not the time to price-shop. Now I'm stuck with body damage, and suddenly the carrier's phone won't pick up, so I'm pretty much eating a grand in body damage on a $600 car that had cherry sheetmetal. Yup my car got damaged in transit. The shipping broker offers a guarantee but its just 500 bucks to cover your deductible and after song and dance with how one carrier hands off to another its just a finger pointing blame game where no one fixes your car. I shipped the same car from Virginia to southern California for $800. Noticed the theme? This car follows me everywhere! 2008. Buddy of mine calls to see if I'd know anyone interested in TWO Mk2 Supras for $1000. Considering my Mk3 had just blew the engine (well, I did that...), yeah, I did know someone. Only catch? The cars were 1000 miles away in Arizona, and had been sitting for a while. This was Toyota at it's best though, the early 80's, those things are indestructible! So, I place an order to freshen the car up at a Chandler area Checker, fly down with a bag of clothes and my bag of tools (that surprisingly, was ok to carry on), and proceed to fix this car up to drive home. Well, preliminary shake down runs go smoothly, car pulls great, gears out at about 130 (hey, I didn't really notice, truthfully, it was very quiet and smooth! ), and... has a bit of an overheating issue. So, that's not gonna work. End up replacing the entire cooling system, cheapest to most expensive. Yep, my luck kicked in, and it was a gummed up, possibly original, radiator, that was causing the issue. Replaced that, drove the piss out of it to make sure I'd have no surprises, then pointed north. About 16 or so hours later, I'm home, exhausted, and ready for a vacation from my vacation. Car ran great for many years, never gave me any issue, apart from a lack of power at the altitude I live, loved that car. Long story short? Shipping is great, but you'll never have the adventure of a fly and drive! I have priced it several times for rollers across the country and it has always been about $1,450 or so. To me that is money well spent. Runners are usually cheaper. Hello everyone, my name is Nicholas Dutko, owner of Car Shipping Carriers. I own the business this article is talking about. I noticed a few people mentioned other brokers and uship. I find it useful to get 2-4 different quotes so the customer can get a good idea of different pricing and customer service each business gives. Also, I have never been a fan of uShip because the companies quoting you are a mix of brokers and carriers. The problem with this is that if you choose a broker and their price, Uship gets paid, then you pay the broker and then the carrier. The same happens if you choose a carrier... uShip will collect their fee (which is essentially a broker fee). Usually your price will be $100+ higher than if you just got a quote from a broker directly without using uShip. You'll almost always find brokers online when you search on Google, Yahoo or Bing. 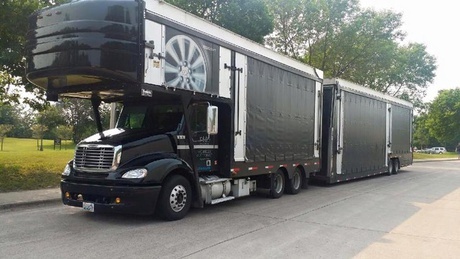 These brokers will help you find the right hauler for your route. If you are looking to learn more about how to ship a car, click the highlighted text. Thank you for read the article here on Grassroots Motorsports and I hope to earn your business sometime in the future. I've had great luck shipping numerous cars across the country and even overseas. All that was spoiled by one bad driver who neglected to secure my car to the trailer. It came loose and hit the car behind it - or rather - started to grind away the perfect - unrestored - barn find 71 240Z. Who knows how many miles were covered before he noticed. Judging from the condition of the car.... more than a few. Adding insult to injury, the shipping company decided the damages were worth a fraction of the repair costs. Next time, I'll buy something ready to drive home. I'll fly there and drive it home myself. The road trip adventure will make a better story. i don't suppose you ship motorcycles, do you? Yes sir. We do ship motorcycles. Check out our motorcycle shipping page. Feel free to get a free quote if you'd like. We will give you 3-5 different quotes to choose from. Sorry to hear about your experience FPZguy. There are horror stories everywhere and in every industry. I wouldn't hold this one experience as a norm because it is not. Next time, this is where a broker would help you. We have the insurance docs for the haulers (from the website all us brokers and carriers use) and we could have submitted a claim to their insurance company for you. Then you would have had a fair shake and got the money you deserved for the work that needed to be done. If I do a quote, will I get bombarded with emails and what not?